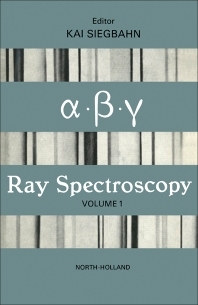 Alpha-, Beta- and Gamma-Ray Spectroscopy Volume 1 offers a comprehensive account of radioactivity and related low-energy phenomena. It summarizes progress in the field of alpha-, beta- and gamma-ray spectroscopy, including the discovery of the non-conservation of parity, as well as new experimental methods that elucidate the processes of weak interactions in general and beta-decay in particular. Comprised of 14 chapters, the book presents experimental methods and theoretical discussions and calculations to maintain the link between experiment and theory. It begins with a discussion of the interaction of electrons and alpha particles with matter. The book explains the elastic scattering of electrons by atomic nuclei and the interaction between gamma-radiation and matter. It then introduces topic on beta-ray spectrometer theory and design and crystal diffraction spectroscopy of nuclear gamma rays. Moreover, the book discusses the applications of the scintillation counter; proportional counting in gases; and the general processes and procedures used in determining disintegration schemes through a study of the beta- and gamma-rays emitted. In addition, it covers the nuclear shell model; collective nuclear motion and the unified model; and alpha-decay conservation laws. The emissions of gamma-radiation during charged particle bombardment and from fission fragments, as well as the neutron-capture radiation spectroscopy, are also explained. Experimentalists will find this book extremely useful.